PULLMAN, Wash. – The No. 16 seeded Washington State Cougars (23-9) defeated the Volunteers of Tennessee (26-6) Saturday evening to advance to the NCAA Tournament Sweet Sixteen for the first time since 2002. Set scores from the match were: 30-28, 25-18, 19-25, and 25-13 in favor of the Cougars.. The Volunteers of Tennessee saw early control of this matchup after a quick 3-0 scoring run over the Cougars put them out in front at 10-7. Washington State came fully prepared, and this opening set turned into a battle after a 6-0 run gave WSU a 14-11 advantage courtesy of back-to-back aces from Taylor Mims, and kills from Jocelyn Urias, and McKenna Woodford. The Vols countered with a 6-0 scoring run of their own to regain the lead at 21-18. The Cougars continued to fight, generating a pair of 3-0 scoring runs after crucial kills from both Woodford, and Urias, and ultimately capped off set one with an Ella Lajos, and Claire Martin block for the 30-28 win. Washington State continued to ride the opening set momentum with a 5-1 run after an Alexis Dirige ace, and a Martin kill to surge ahead of the Volunteers. The Cougars kept the pressure on Tennessee with scoring runs of 3-0, and 4-0 with multiple kills from Mims, and an additional from Woodford to put the home lead out to 18-9 overall. WSU sealed the second set off with an Ashley Brown kill, and winning the set after a service error from the Vols. Roles were reversed in the third set of play in this match, as Tennessee took control of the game with a pair of scoring runs at 3-0, and a 5-0 run as well that put the Vols up 20-10 over Washington State. The Cougars did cut down the opposing lead a bit with a 7-1 run featuring multiple blocks from Urias, and a Penny Tusa ace. UT would end up claiming the set over WSU however, scoring back-to-back points for the 25-19 set victory. 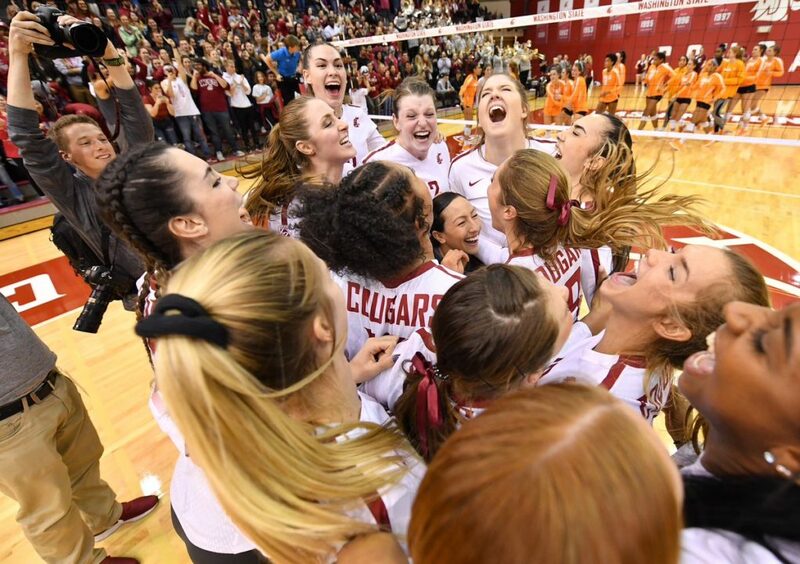 The Cougars and the Volunteers were locked in an intense battle early on in set number four, until Washington State began to find its’ rhythm, totaling six straight points to jump out to a 16-9 advantage. The offensive attack was clicking in this final set as kills from Mims, Woodford, Brown, and Urias continued to fuel WSU ahead to a late 20-12 lead. WSU finished Tennessee off with a 4-0 run from kills by Woodford, and Mims, along with a service ace from Taylor, and a block from Brown and Urias to win it 25-13 and advance. Tonight’s state of the match features the last time the Cougars advanced to the Sweet Sixteen in 2002, when Washington State defeated Kansas State in Manhattan, Kansas to continue on in the NCAA Championship Tournament. McKenna Woodford continued to lead the offensive attack as she totaled 19 kills, while hitting .261 during the contest. Taylor Mims, and Jocelyn Urias each notched double-digit kills with 17, and 14 respectively. Ashley Brown posted her 17th double-double of the year as she recorded 43 assists, and 10 digs in the win. PULLMAN, Wash. – No. 19 University of Tennessee fell in the second round of the NCAA Tournament to Washington State in four sets. The Lady Vols (26-6, 16-2 Southeastern Conference) season ends after making their first NCAA Tournament appearance since 2012 and their first appearance in the second round since the 2011 campaign. After dropping the first two sets of the match, Tennessee rallied back to take the third set, leading nearly the entire way. Up 8-6, the Lady Vols went on a 7-1 run to increase their lead out to eight points. Tennessee was able to force Washington State (22-10, 12-8 PAC-12) to hit negative in the set with nine hitting errors. The Lady Vols had five blocks in the frame including four from freshman Raquel Perinar who came in along the front row to start the frame. In the opening frame, Grubbs helped pace the Lady Vol offense with seven kills. Tennessee dropped a close opening set in extra points 30-28. Defensively, the team was able to limit the effectiveness of Cougar senior Taylor Mims who lead the team in kills/set. The Lady Vols held her to a negative hitting percentage and just four kills at the midway point of the second set. Grubbs added seven more kills to her name in the second set as the junior hit the ball at a .321 clip through two sets. Washington State took the second set to take a 2-0 advantage heading into the break. Tennessee’s 14 game win increase from a year ago is tied for the most in program history and is the most in the NCAA era. The Lady Vols 26 wins mark the most since the 2011 season and is the third most in the rally-scoring era. In the match, Brooke Schumacher moved into fourth all-time in the Tennessee digs list. The senior finishes tied with Kylie Marshall (2006-09) for fourth all-time with 1,374 career digs. Erica Treiber finished the season with 46 services ace which ties the second most by any Tennessee player in the rally scoring era and is the most since the 2002 season. Overall on the season, the Lady Vols finish 4-4 vs. ranked opponents, giving them the most wins by an SEC team over ranked opponents and making them the only team with a winning record vs. top-25 teams.